Well, as Co-pilot Egg says, "At least Christmas is over until next October." This sentiment is not a reflection of the title of this post, however. The misery of this December has been the weather. Not much by way of flyable. Pretty nasty. I have struggled to fill the time productively. How I miss the days of having something to build! I did fix that pesky light switch, though. The culprit made one fatal mistake - it threw a spark. I pulled the face plate and couldn't help but notice that part of the plastic housing of the switch was melted. If only every forensic investigation could be so easy! The weather finally gave us a break and I was able to fly a little bit this morning, albeit only as far as Urbana-Grimes (I74) for a quick breakfast. Alone. Which has the effect of making the quality of the food more important, as opposed to the normal quality of the company. This is, alas, not their strong suit. The coffee tastes like mud (obligatory: "Of course it does; it was just ground this morning") and the sausage gravy proves that the chef has never attended a country cooking class or picked up a recipe. I know this because the flour had not been "cooked." With sausage gravy, if you don't brown the flour a little bit before mixing in the milk, it ends up tasting like milk-flavored paste. Minus the salt. None of that mattered, though, because it was just so rejuvenating to be 1) out of the house, and 2) in the air! I was in no hurry at all, so I decided to test out my new geo-synchronized approach plates. I loaded up the GPS LNAV approach to runway 2, even though I would be landing in the opposite direction. 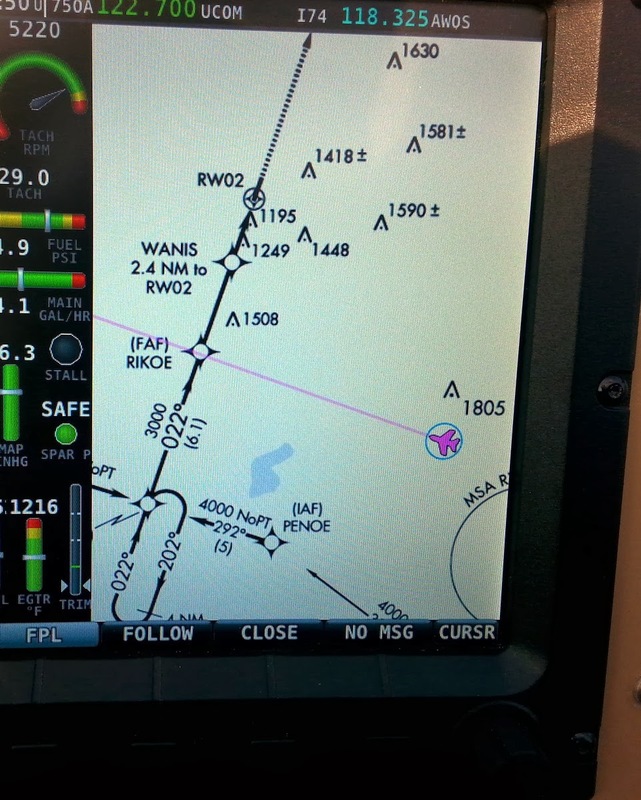 on the plus side, it was amazingly easy to fly the approach what with the little airplane crawling across the chart. Because I wasn't really flying the approach, I didn't head out to PENOE, which is an IAF, or Initial Approach Fix. Instead, I saved 6.1 miles and headed straight towards RIKOE, which is the Final Approach Fix. Had I been flying the real approach, I would have flown to PENOE at or above 4,000'. 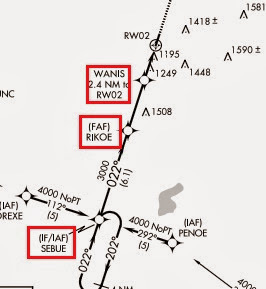 At the next fix (SEBUE), I would turn right to follow the black line to RIKOE. Once established on that line, I could descend to an altitude no lower then 3,000' until I reached RIKOE. After RIJOE, I could descend to 1,860'. Once crossing WANIS, I could go as low as the Minimum Descent Altitude (MDA) of 1,500' which would be only 500' above the cold, hard ground*. From there I would either see the runway or not. At WANIS, I would be only 2.4 miles from the end of the runway which, from the perch of an airplane cockpit, looks like almost nothing. I would be allowed to stay in the kludge, should there be any, until only one mile from the end of the runway. If I still couldn't see it from a mile away, I would have to climb and continue on, following the dashed line. At that point I could either come back and try again, or elect to go somewhere else with better weather. As it was, I flew at 2,000' to WANIS and just turned a little to the right to run parallel to the runway in my right downwind to the opposite end of the runway. It was ever so easy. I just flew the little purple plane down the line, just like a simple video game. It was simple, but that is only because it wasn't a real instrument approach. Dynon still has a bit of work to do before this will work well on a single screen installation like mine. 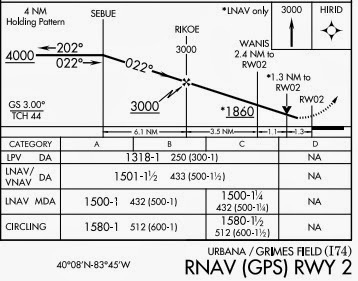 Every time I wanted to look up a frequency or select a different waypoint, I lost the chart screen and would have to reload it again, which took a number of button presses. That would add to the already heavy workload of flying a small airplane in bad weather - I'm not sure I would be up to it. The avionics also played a role in the return flight. As I was climbing out of Urbana and turning back towards Bolton, a Cessna called in saying he was ten miles south west, inbound. I recognized the tail number as one of the Bolton rentals, so I figured we were going to be nose-to-nose. This is one of the problems with GPS: we're all within yards of each other if we're on the same direct-to flight plan, with the positions reversed. Luckily, he popped up on my traffic display - he was at 2,900' and descending, while I was climbing to 3,500'. I gave him a call to tell him that we were going to be passing each other, but that I had his data on my display and would stay well above him. That kind of knowledge is very welcome to a renter. The planes they fly don't have anywhere near the electronic capabilities that many Experimentals and very expensive modern store-boughts have. I arrived back at Bolton to find the Columbus Police Dept. helicopter practicing emergency landings. To sequence me in, the tower had him do a 360 degree turn out of his downwind leg. Lucky for him, I'm pretty comfortable in the RV-12 now and was able to make an expedient approach that had me rolling on the runway before he managed to finish his 360. All in all, it was less than an hour in the air, but it felt oh so good! * Airplane altitudes are flown at what is called the MSL (Mean Sea Level) altitude. The ground is at AGL, or Above Ground Level. Because Urbana is roughly 1,000' above sea level, 1,500' MSL (the altitude shown on my altimeter) is only 500' AGL. And 500' is not a lot! When do I get a ride in the newly painted machine? On the subject of "satisficing"